AnnMarie McCracken, an undergraduate student at Washington State University, has been awarded a research grant from Sigma Xi, The Scientific Research Honor Society’s Grants‑in‑Aid of Research program. Only 12 percent of the 810 grant applications were approved for funding, and only 17 of the approved proposals were from undergraduates. McCracken is pursuing a double degree, including a bachelor’s degree with a major in French, and a bachelor’s degree in anthropology. 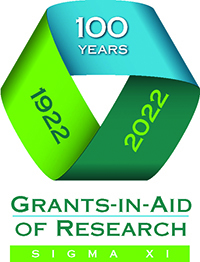 The Sigma Xi Grants‑in‑Aid of Research program has been funding research by undergraduate and graduate students since 1922. The Committee on Grants‑in‑Aid of Research selected 17 undergraduate students, 24 master’s degree students and 56 doctoral candidates to receive grants. Collectively, the students received $87,696. The awardees are from six countries. Students may apply for funding from the program twice each year on the Sigma Xi website. The next application deadline is March 15. The grants are made possible by designated funds from the National Academy of Sciences and from donations.